Good Monday afternoon friends! You all are in for a treat this fine Monday. You’re getting a double bonus on recipes today! This one, plus another tonight for the $5 Dinner Challenge! 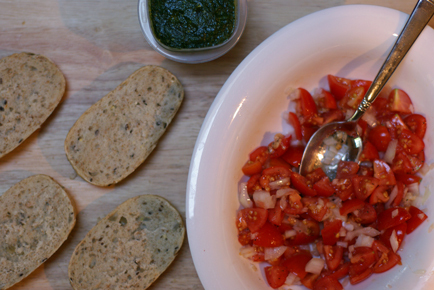 I was working on dinner over the weekend when Steve pops into the kitchen with a few handfuls of itty bitty tomatoes. I thought the garden was “done.” I haven’t officially closed it down, but I thought it was finished producing! I gladly took the tomatoes. And worked them into the meal. Homemade Pesto, from the freezer. Bread rolls, marked down on special, from the freezer. 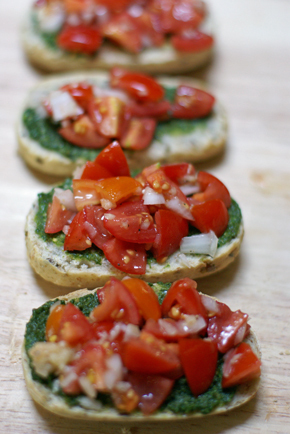 And we’ve got ourselves the makings of a Pesto Bruschetta appetizer. Since I’m all about being resourceful, I just cut the rolls in half…and they look just like slices of French bread loaf…right?! (You’d probably never have known had I not told you!) These are just multigrain dinner rolls that I got on Manager’s Special and stashed in the freezer. Perfect, for a time like this! 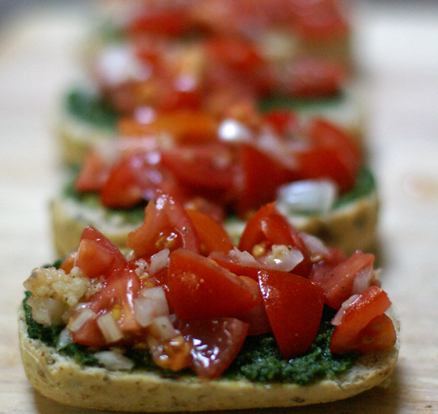 Spread on the pesto. Top with the topping. Eat. In a mixing bowl, toss the tomatoes, onion and garlic. Drizzle about 1 tsp of olive oil over the top and season with salt and pepper to taste. 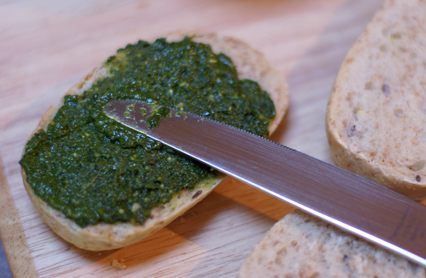 Lay out the sliced bread and spread a knife-ful of pesto over the bread. Top with the tomato mixture.